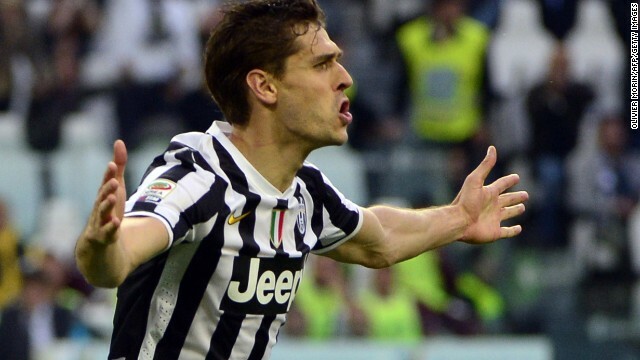 Fernando Llorente scored both goals as Juventus defeated Livorno 2-0. (CNN) -- Fernando Llorente fired Juventus eight points clear at the top of Serie A and to within touching distance of a third successive league title Monday following a 2-0 win over Livorno. The Spain international scored twice in three minutes to increase his side's lead at the top of the table and ease the pressure on Antonio Conte's side. Juventus, which suffered a shock 2-0 defeat by Napoli last week, holds a sizable advantage over second place Roma, which is chasing its first Scudetto since 2001. Conte's men are hoping to become the first team to win the league by claiming 100 points and with six games remaining, it looks set to reach the landmark. Llorente's 32nd minute strike gave the Bianconeri the advantage before the striker added a second by heading home Andrea Pirlo's corner. Juventus will now turn its attention to Thursday's Europa League quarterfinal tie with Lyon in which it is hoping to build on a one goal advantage from the first leg. Elsewhere, Milan gained a 2-1 away win at Genoa. Adel Taarabt gave Milan a 20th minute lead before Keisuke Honda doubled his side's advantage after the interval. The home side pulled a goal back with 17 minutes remaining to ensure a tense finale but Milan held out to claim all three points. In England, Sunderland suffered a huge blow to its hopes of escaping relegation from the Premier League. Gus Poyet's side was beaten 5-1 at Tottenham -- despite taking the lead through Lee Cattermole. The defeat leaves Sunderland bottom of the league, seven points adrift of safety but with two games in hand. Emmanuel Adebayor equalized for Spurs with Harry Kane and Christian Eriksen adding further strikes. Adebayor added a fourth before substitute Gylfi Sigurdsson rounded off the scoring late on. Tottenham moves up to sixth and is five points off the final Champions League place with five games remaining.